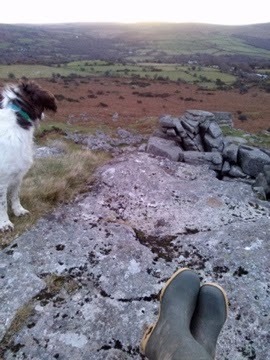 Somehow over Dartmoor there seems to be more sky: more headspace. It's the perfect place for freethinking wanderers. The ground is bogged, so land level observation is required except when the boots strike granite. It's rare indeed to sink in granite. 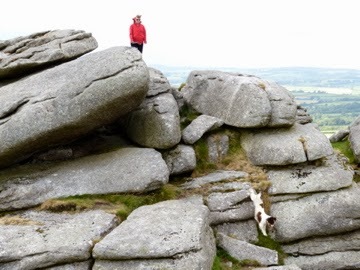 Astride the Tor top rock eyes lift to see how clouds pattern. How fleeting it appears; how easily dark and light can shift. Yes, I suppose the lesson is just this. Refreshed by literally lofty thought, feet follow spindly trails through low gorse. As though an old grass tussock there transmutes, a bird suddenly exists and flies. A mouth, awed, forms an Oh. And while this distraction leaves a sharp impression of fine beige feathers, the eyes swoop further, inspired, vaguely aware of a person paused up on an outcrop; standing somewhat short of stature, rotund in a white puffer jacket. The person shifts, reveals four legs: is actually a sheep. Transmutation well-addressed, Lisa. When earth teaches itself to us, there's a definite alchemy involved. There's an essay by Ursula LeGuin--do not take me for granite. Have you read it? Just tracked it down online!